Rumacure oil is an effective ayurvedic oil for joint and muscle pain that helps to reduce joint stiffness and inflammation and strengthens muscles, ligaments and tendons. Joint and muscle pain are commonly affecting problems but can be debilitating if not treated properly. Joints and muscles can become painful and stiff due to overuse, repetitive motion, strain, sudden pressure and jerks. These organs also need regular nutrition to stay energized and healthy, people suffering with bone disorders or arthritis suffer with severe pain, swelling and stiffness in joints. Weaknesses in body can cause lethargic muscles which become prone to suffer with sprains, pulls and injuries. Rumacure oil is ayurvedic oil for joint and muscle pain which relieves pain and swelling, promotes joint and muscle movement and on regular use improve their strength and endurance. This ayurvedic oil for joint and muscle pain is excellent for ageing individuals to gain stronger and agile body. Muscles move bones to make joints function, ayurvedic oil for joint and muscle pain enhances flow of blood to keep them stronger and nourished. This oil improves nerve functions to provide better control over movement and prevent pain related to weak nerves. Ayurvedic oil for joint and muscle pain goes deep into skin and numb pain-signal carrying nerves to provide relief. This ayurvedic oil for joint and muscle pain also possesses anti-inflammatory properties to diffuse swelling and promote joint movement. Regular use of this oil strengthens muscles, ligaments and tendons to provide stronger and powerful joints which withstand effects of strain, pressure and ageing. Some of the herbal oils used in this ayurvedic oil for joint and muscle pain initiate process of cartilage rebuilding, cartilages get damaged due to ageing, arthritis, infections and higher acid presence in blood, Rumacure oil curb these issues and repair damaged cartilages for smooth and healthy joint movement. Rumacure oil handles conditions like warmth, redness and tenderness in joints caused by rheumatism and also increases range of joint motion by strengthening ligaments. This ayurvedic oil for joint and muscle pain keeps synovial fluid clean and improve reach of immune system to prevent infectious agents from affecting it, clean synovial fluid maintain healthy and strong cartilages and enduring joints. This herbal oil to reduce joint stiffness energizes muscles which can bear pressure of strenuous or repetitive movements untiringly and painlessly and also increase weight and pressure bearing capacities of joints. This joint and muscle pain relief oil is effective against mild issues and also against serious causes of joint and muscle pain like arthritis. Rumacure oil is joint and muscle pain relief oil which is made by using highly effective and fast-acting herbal oils. These oils have been used since ancient times in Ayurveda for providing safe results. This oil is so safe that even people with sensitive skin do not see any rash or irritation on skin. This oil is fit to be used by people of all ages and for prolonged duration. 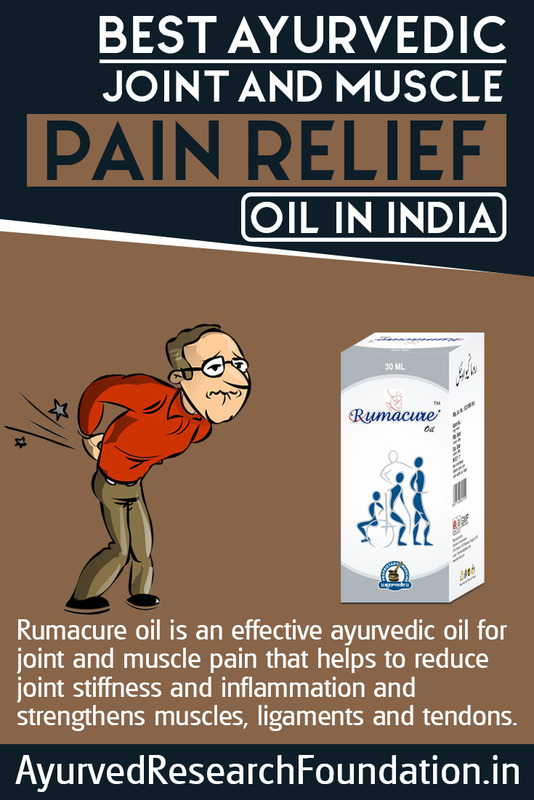 Rumacure oil comes loaded with bunch of time-tested herbal oils famous for relieving muscle and joint pain. The ingredients of this oil are – Dalchini, Kapur, Gandhapatri, Buleylu, Tarpin and Castor oil which in combination work excellently to enhance joint and muscular strength and endurance to provide smooth and painless movement. Take 10 to 15 drops of Rumacure oil and apply over affected joint, rub this oil for few minutes till it gets absorbed in the skin and repeat twice in a day. Continue for required duration and avoid misses. This oil will relieve pain, swelling and stiffness in joints and muscles and on regular use increase their endurance and strength. People suffering with joint and muscular problems gain complete relief within 4 months of use. But people suffering with bone disorders, arthritis or are at later age may need to use Rumacure oil for 6 months to gain maximum benefits. Avoid harmful foods which cause slowness in digestion and cause constipation. Eat high fibre fruits and vegetables and include fat-free dairy products in diet for healthy bones. Also include green vegetables to gain iron and other minerals to nourish muscles and gain strength. We accept payment on delivery in India. We also accept payment through NEFT and you can also send us cheque or DD, we also provide details of our account for you to deposit cash. We will cover the product in a plain envelope so that no details are evident from outside. You will get your order within 3 to 5 days anywhere in India and we ship through FedEx to ensure timely and safe delivery. I got this product for my grandmother. Only a month but she can see huge difference in joint movement. Thinks it’s a magic product. I’m about to order a second bottle for her, as the first one is finished. This massage oil works remarkably well on all kinds of pain and stiffness. It is amazing for arthritis, joint, muscle and other kind of pain. You will not regret if you purchase this product. I bought this for my father as he was having the problem of frozen shoulder. Now after using this, pain and stiffness were gone. Will buy more!! After trying this arthritis massage oil I feel really better than before. I was really surprise at the quick response!! Excellent product to prevent muscle ache!! I am truly satisfied with Rumacure Oil. I felt the need to write this as I know there are so many people like me who have pain in their joints, and have been looking for something natural to make them feel better. This oil works well. This oil works so much better than any other oil that I have tried. I will not use any other brand.